Which watch should find a place on your wrist? The Huawei Watch 2 and the Samsung Gear S3 are smartwatches that come in two different models. For something more suit-friendly, both offer Classic models with more luxurious designs. If you want something to hit the gym with, then cast your attention at the Gear S3 Frontier or the Huawei Watch 2 Sport. Whichever model you go for, you're guaranteed features. But there are plenty to separate the two sets of smartwatches, most notably in the software department. So how do the two compare? We've lived extensively with both and here's our breakdown of how the Gear S3 fares against the Huawei Watch 2. If you're looking for a more traditional looking smartwatch, you'll have to look elsewhere — both of these devices sit firmly on the sporty end of the spectrum. And both are heavy packages, clocking in at around 60g, despite differing slightly on overall dimensions: the Gear S3 is 49 x 46 x 12.9mm while the Watch 2 is 45 x 48.3 x 12.6mm and heftier than its predecessor. In the case of Huawei's watch, the slim rim of the original is replaced by a rugged bezel with index markers. There are three colours to choose from in the Sport variant, with a paint-flecked grey device lining up alongside a more traditional black model and an eye-popping orange option. But despite the materials used and a solid (if a little small) screen, the Huawei Watch 2 has a noticeable lack of premium feel in comparison to the original and to Samsung's range. The Gear S3 offers the same kind of mix in terms of models, giving you a Classic or Frontier option to choose from - the latter, of course, being the more outdoorsy device. And though the Classic is more apt to pair with your work attire, both involve frames that are unquestionably masculine. The screen, as is often the case with Samsung, also shows up nicely here. The bezel design allows you make full use of the 1.3-inch, 360 x 360 AMOLED touchscreen display, too, which is something that can't be said for the Huawei Watch 2's 1.2-inch, 390 x 390 screen. So you're offered a relatively similar premise when it comes to overall design, but just how you'll be making your way around each device is a major point of difference. The Gear S3 offers a rotating bezel, which allows for navigation without you laying paws on the screen, and the Watch 2 will instead have you use the two buttons to access menus and shoot back to the home page. This is a fall-point, especially when Android Wear 2.0 allows for a similar kind of scrolling. Samsung's offering is the marginally bulkier option of the two, but better navigation through design and general build quality are why it will triumph for most in this department. In one corner is Tizen, and in the other is Android Wear, so there's some variance in just how you'll be interacting with each device and which apps are available for your perusal. Both provide you with a refined experience and ample customisation, but it's worth noting that this is where smartwatch battles are generally decided. If you take Tizen's latest drop, you're getting a simple, easy-to-use OS that runs in sync with the rotating bezel. Notification support is solid and provides you with ample options to take your next step after receiving a buzz. Where Samsung's option falls down is its app support in comparison to Apple and Android, though. Meanwhile, Huawei brings a relatively vanilla Android Wear 2.0 offering to the software table. This isn't necessarily a negative, with the software being very strong and providing you with the sorely needed Android Pay, Google Assistant and standalone apps. Despite this, though, there's nothing unique or killer here to separate it from the broad field. If you're looking for which device can help mimic your wallet, it's worth noting that Samsung generally beats all comers. You not only get support for NFC systems, but magnetic secure transmission (MST) is also included, unlike on Android Pay. When you stack the two up, this really comes down to preference. 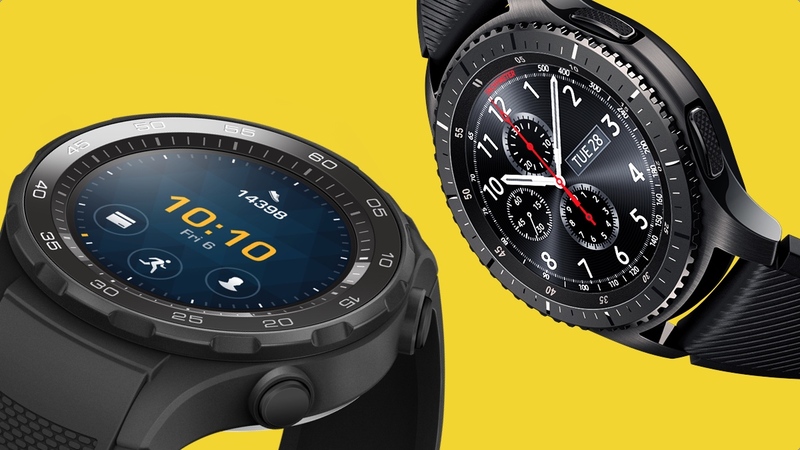 If you're not a Samsung smartphone owner that wants to tether the same brand together, you're likely to find the more impressive app library of Android Wear a deal breaker. It's also important to keep in mind that both of these devices work with Android and iOS devices. With both companies emphasising sport in the design, it's obviously a natural step to see this transfer to features within the watch. If you opt for the Gear S3, there's built-in GPS to track activities like running and cycling, plus a heart rate monitor, barometer and speedometer to tackle the finer points. Automatic exercise recognition works with multiple activities and rep counting helps you keep a check on sets of lunges, crunches, squats and burpees. There are also more basic fitness tracking features to give you a breakdown of steps, elevation and calorie burn, plus a vibrating push when you've been sitting down too long and not been active. Everything is powered and stored inside the steadily improving S Health platform, though there's a bevy of data that can be viewed from the watch itself. And while the Huawei Watch 2 certainly falls down in some areas, fitness is one of its stronger suits. The smartwatch tracks a ton of run and workout metrics, including distance, speed, heart rate & HRV, steps, calories and gait. It also provides VO2 Max data after runs in order to give you advice on recovery time and training effects. Another bonus here is the option to store fitness data in either Google Fit or the Huawei Wear app, even though you do have to download an additional Huawei Health app to get things ready. So, you've read about the fancy features, but which device can offer them for longer? Well, the Watch 2 has been equipped with a 420mAh battery, while its rival houses a 380mAh one. It's not as open and shut as having the bigger battery, though. During testing, we found that the latter was able to average around three days, even when keeping screen brightness relatively high and using the GPS tracking regularly. Turning off the always-on display mode helps to push that closer to the four day mark, and even a hour-long run with GPS tracking only saps around 10% of total battery. In Huawei's case, things are a little different. While this is certainly the best Wear battery we've encountered so far, it's still only providing you with around two days of life. This has it lagging behind the Gear S3, but thankfully you're given the option to prolong this. Enabling Watch Mode at around 10% will extend the device's staying power for another 40 hours. Of course, this sees you turning off GPS and Bluetooth, but it's a refreshing alternative to a blank screen. Despite being announced in February, Huawei has refrained from revealing UK/US pricing so far. The Chinese company has previously announced that the device is priced at €379 for the 4G Watch 2 and €399 for the stainless steel Watch 2 Classic. That translates to roughly $400 and $425, though whether this is any indication of a final price remains to be seen. The Gear S3, meanwhile, will set you back $349 for both the Classic and Frontier models. Which one deserves a spot on your wrist? When it really comes down it, these are two smartwatches that provide a lot of the same things. For our money, the Samsung Gear S3 offers the sturdier design, stronger battery and solid fitness metrics, even if it is slightly bulkier than the Huawei Watch 2. The biggest difference, of course, is the operating system. Tizen is a simple, friendly beast and works nicely with the design of the Gear S3, though the lure of a fresh Wear-packing device has undeniable benefits — even if Huawei hasn't capitalised fully on its potential. Here's the bottom line: the Gear S3 is the best smartwatch running Tizen, but the same can't be said for Huawei and Wear. This, if you're being brutal, makes the Watch 2 potentially redundant when forced to compare it to the likes of the LG Watch Sport, as all are in a similar ballpark when it comes to price.